The Center produces a variety of publications for researchers, farmers, students, educators, and home gardeners. Center publications include the Research Briefs series, as well as For the Gardener "tip sheets" for organic gardeners, and the News & Notes of the UCSC Farm & Garden quarterly newsletter. Available publications are listed on the Center Publications page. 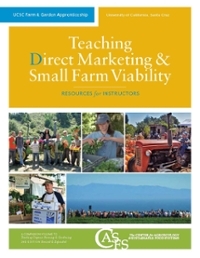 Instructional materials produced by the Center include the popular Teaching Organic Farming and Gardening: Resources for Instructors, and Teaching Direct Marketing & Small Farm Viability: Resources for Instructors. These and many other of the Center's publications are available for free download (see links at left).